Middle Georgia State recently signed an agreement with Université de Reims Champagne-Ardene (France) that will allow the two universities to operate short-term exchange programs for education majors. 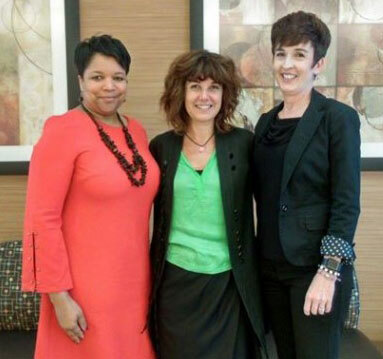 Dr. Laura Thomason, MGA's director of International Programs, and Dr. Loleta Sartin, chair of the Department of Teacher Education and Social Work, welcomed ESPS Reim's Sophie Hourdin to the Macon Campus to plan the programs. Student exchanges will begin in Spring 2020. Welcome to the Department of Teacher Education and Social Work, a vibrant and growing place committed to successfully preparing the next generation of scholars, practitioners and professionals. We are delighted that you have chosen to join our learning community! Strong schools are the foundation of any community and economy and the Middle Georgia State University Department of Teacher Education and Social Work is playing a key role in educational innovations and improvements in our area. Through the outstanding work of our faculty, staff, and students, the Middle Georgia State University Department of Teacher Education and Social Work is helping to improve the lives of people in Middle Georgia, the nation, and the world. The Bachelor of Science in Public Service is among the College’s oldest degree offerings and has a multi-decade track record of graduating students who are ready to immediately make a difference in direct-service settings. The Department of Teacher Education and Social Work itself is continually evolving in new ways to meet the demands we know teachers face on a daily basis. To be most effective as a professional in today's global classroom and economy, we all must think beyond our own experiences and be open to new ways of teaching and learning. Our new Education Building represents a new kind of education school. It is designed to foster learning, teamwork, collaboration, and development at every age level, in every subject, and in many domains of performance. It features the latest innovations to accommodate a variety of learning styles, including groundbreaking technology to aid instruction. This state-of-the-art teaching facility assists the Department of Teacher Education and Social Work in attracting the best and brightest teacher education students and ensuring them of an education informed by the latest teaching methods and technologies. In addition, the building supports a focus on pedagogy that fosters collaboration, builds teacher candidate skills, and teaches appropriate use of technology in the classroom. I am honored to serve as Chair of the Department of Teacher Education and Social Work at Middle Georgia State University. It is a privilege to work with such a distinguished faculty and staff. I invite you to share your ideas, enthusiasm, interests and concerns with me by contacting my office. Please take time to navigate our website to learn what we are doing. Your feedback will allow the Department of Teacher Education and Social Work to continue to engage, innovate, and expand our reach. I wish you every success in your studies.